North Kerry League Division 2. Played in very windy conditions at Ballyduff on Sunday last two very much understrength teams especially Ballyduff served up a very competitive game of football in Round 2 of the McCarthys Insurance Brokers Senior League Division 2. In fairness Asdee did have the majority of play and deserved their win as they led from the 3rd minute but they were never really able to pull away from a dogged Ballyduff and the decisive score of the game came in the 4th minute of the second half when after a great build up by the visitors; wing back Jack Keane was on hand to boot the ball to the net as the score at that stage read 0-5 to 0-4 in favour of Asdee. Playing with the aid of a tricky wind that more- or less blew diagonally towards the Village goal up stepped Chris White to split the posts after 2 minutes. Wides came a plenty on both sides before Eoin Tydings, Paul O Carroll and Darragh Keane, (2) to leave the visitors 0-3 to 0-1 at the end of the first quarter. So after having the majority of play the home side responded in style with Darragh Goulding who was a thorn in the Asdee rearguard kicking over 3 points to level up matters. Then with virtually the last kick of the game Kieran Kelly kicked a massive point to see Asdee lead at the break by 0-5 to 0-4. The second half continued to entertain with scores hard to come-by as defences were to prove difficult to get past with Paud O Carroll and Paddy Moran impressing for Ballyduff while Martin Collins, John Doran with goalkeeper Stephen Lynch and Jack Collins both making their debut in senior football all performed very well. It was nip and tuck and as already stated Jac k Keanes goal in the 4th minute of this half gave the visitors a bit of breathing space; no doubt Ballyduff were never going to give up but were guilty of some poor scoring decisions when presented. Darragh Goulding their top scorer popped over points to bring his tally to 5 points and Padraig Harrington( 1) finished their scoring as in between Paul O Carroll, ( 2) and Eoin Tydings (1) sealed a 4 point victory. Ballyduff did get a free which was to be the last kick of the game and Darragh Goulding say his powerful shot come off the crossbar as Referee, Dermot Hughes, Listowel Emmets blew the final whistle. Teams. Stephen Lynch, Con Carmody, Martin Collins, Brian Coughlan, Jack Keane, 1gl, John Doran, Shay Doran, Kieran Kelly, 1pt, Darragh Keane, 2pts, Jack Collins, Sean Keane, Darren Russell, Paul O Carroll, 3pts, Eoin Tydings, 2pts, Eoin Kennedy. Substitutes, Dinny Dalton for Shay Doran. Week 2 winners in our Fundraisers”Golden Goal” were; Mairead Doyle, Asdee Village and Mike Enright, Beale. This is in conjunction with upcoming Fixtures in both National Football and Hurling Leagues and Championship; (Televised games). Tickets are now available and will be on sale each week for the duration of both National League and Championship from Club members and at the usual outlets; “Jack Jays” Bar and John Pius at E2 each with E40 to be given out each week to the winning number that corresponds with the first goal scored. SCOR. Congratulations to the Ballydonoghue Leiriu group who won the County title in this catagory on Saturday last in the Marion Hall, Moyvane. They now go on to the Munster Semi Final in the Ovens Community Centre on Saturday February 23rd. McCarthys Insurance Brokers North Kerry Division 2 League; Sunday February 17th, Con Brosnan, Park, Moyvane, Asdee v Moyvane, Sunday February 24th At Willie Walsh, Park, Knocknagoshel; Asdee v Knocknagoshel, Sunday March 3rd , Asdee received a bye. County League Division 5. 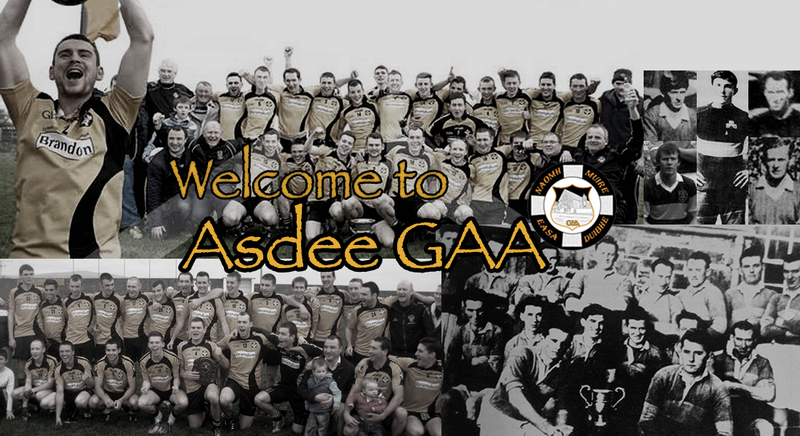 First Round, Asdee v Ballylongford, Sunday March 10th. Minors will play in Division 3 “B” of the County League which is pencilled in to start on Saturday February 16 and will be a home game against Castlegregory. 3pm.